A FIERCE debate has ignited over the ethics of prescribing alternative therapies that may lack an evidence base. Consumers were increasingly exposed to “a plethora of nonsense (non-science) claims that waste their money, distance them from effective care strategies and, not infrequently, cause harm”, he wrote. “… it is important for GPs to discuss CAM [complementary and alternative medicine] options with patients to ethically fulfil their role as trusted primary care providers”, she said. Professor Dwyer criticised doctors who practised “integrative medicine”, an approach which combines conventional medicine with complementary and alternative therapies. “To do so … is to abandon scientific medicine … for an approach that does not believe in testing, is happy to exploit the placebo effect and rejects a psychological influence on health”, he wrote. Professor Dwyer’s comments sparked a strong response from the Australasian Integrative Medicine Association (AIMA), the peak body for doctors practising integrative medicine. AIMA president Professor Kerryn Phelps said Professor Dwyer’s comments “make my blood boil, because they are so ignorant and so offensive”. “It is a professional insult to the highly intelligent, science-based doctors who are practising integrative medicine. It’s also a very narrow, parochial view. In the US, more than 60% of medical schools have an integrative philosophy”, she said. Professor Phelps described integrative medicine as “the emerging mainstream”. Professor Phelps said given the number of people using these therapies, it was unethical for doctors not to practise in an integrative way. “Doctors who don’t inform themselves in this area, which is impacting on their practice whether they know it or not, are not practising optimally and may well be putting themselves at [legal] risk”. Dr Pirotta said ethically recommending any treatment took place within the framework of a careful history, examination and diagnosis. Professor Dwyer said scientific study of alternative medicine was important, and that any treatment found to have supportive evidence should be embraced by orthodox medicine. However, Dr Pirotta said that a lack of evidence did not mean that a treatment was ineffective or harmful. “It is estimated that as little as a quarter of conventional medicine is based on level-1 evidence”, she wrote. Dr Pirotta said the evidence base for complementary treatments was slowly growing, despite barriers such as the lack of financial reward for research investment. Professor Phelps said evidence was a “moveable feast” and cited changing evidence for orthodox treatments such as cyclooxygenase-2 (COX-2) inhibitors and hormone replacement therapy. In a comment published in this issue of MJA InSight, Dr Sue Ieraci wonders why a sophisticated consumer market holds such belief in alternative medicines. I am apalled by Prof Phelps and Dr Pirotta’s position on this. Evidence is either present or it is not, it is not a “moveable feast”. Alterrnative mediications should not be used in a scientific profession without evidence of efficacy. To say that the concept of evidence is flawed is not an argument against evidence based medicine. What is the alternative, superstition? I have a 1463 page textbook of medicine from 1920 called “Domestic Medical Practice” (Domestic Medical Society, New York) which confidently asserts that influenza is not an infectious disease. This was written two years after the great flu pandemic of 1918. Actually the book is full of such non-evidence based statements. It makes you realise just how important the concept of evidence is to effective medical practice. The big concern I have around this debate is that for many (but no means all) complementary therapies there is plenty of evidence available. Often though, that evidence is just not in journals that we usually look at. I have seen way too many cases of doctors who will dismiss out of hand certain complementary therapies simply because they personally are unaware of the evidence base for them. Having had a couple of extremely positive personal experiences with a couple of complementary therapies I am well aware that there are complementary therapies out there that work and that therapists can provide evidence when asked to. In this context while we need to be careful about what we advocate, and at least check up on the available evidence ourselves. I think we do our patients and our own credibility a grave disservice if we adopt the blanket hostility to complementary therapies that has characterised the medical profession to date. The bottom line is people go elsewhere, they find therapies that work for them despite our skepticism, and they re-evaluate their opinion of us in the light of that experience. A “head in the sand” attitude is not going to do our credibility any good at all. It is Dr Phelps’ views that should make one’s blood boil. Is it justification to prescribe placebo or worse, because some USA doctors do? And the threat of legal action against doctors who don’t involve themselves with CAM is ludicrous. If there is no evidence for something, how is a doctor supposed to evaluate an agent’s claims? The fact that the esteemed Dr Phelps is involved with complementary medicine in her practice says a lot more about her commitment to science versus her pandering to her uneducated patients’ views. One of the great problems we face is that even well observed and documented individual patient experiences are not regarded as evidence. This sort of sophistry is why alternative medicine gets away with, at times, blue murder – literally in WA we have had multiple cases recently of alternative quackery hastening deaths for cancer patients. If you really believe that you have well observed case histories that are worth discussing with your peers then do the hard yards, publish them, there are many journals that do publish case reports. However, a case report is only ever the basis of a discussion or postulation of theory. What you describe as the basis of your practice is anecdote and the multiple of anecdote is not evidence although if well presented and subject to peer review it may lead to the start of that important outcome. However, as Sue Ieraci’s article highlights, the wisdom of Hippocrates still extends to this era when he said “There are, in fact, two things, science and opinion; the former begets knowledge, the latter ignorance” and opinion-based practice is the well-travelled road to quackery. I favour John Dwyer’s model – medicines are either “good” (they have been shown to work, and their benefits far outweigh their harmful effects and cost) – or “bad” (they don’t satisfy those criteria). As new drugs are developed, they can either undergo rigorous testing and be accepted as cost effective (thereby becoming “orthodox” treatments), or not (thereby remaining “alternative”). Why shouldn’t we apply the same standards to all therapeutic products that are sold? It’s certainly not because of the cost of testing – as a community, we are spending millions on untested therapies. Why not spend money on products that have passed rigorous testing? Alternative medicine that is shown to work loses the word “alternative” in its description and becomes simply “medicine” and gets incorporated into standard “evidence-based” treatment that I hope is practised by ethical honest doctors. So the argument for doctors being involved in CAM therapy is that (a) many CAM therapies are not harmful; (b) lot of people believe in it; and (c) some CAM therapies may actually be effective, only if research was conducted to prove their efficacy. But with (a) even if CAM does not cause a lot of side effects, they do cost real money. In relation to (b), just because a lot of people believe in something does not make it right. Good Lord… it just goes to show that even apparently smart people are not immune to nonsensical thinking. Medicine began shooting itself in the feet back when I was training in the late ’80s. Schools began to incorporate “alternative” theories of medicine. Political correctness was all the rage. It was a victory for post-modernism. Apparently it doesn’t matter whether therapies work or not – just that people think they do, people want them, so medical doctors should provide them with them. Pharmacies have gone down the same unethical corporate path by stocking and advocating bunkum homeopathy products. No wonder the medical and pharmacy professions are now no longer trusted. If you can’t beat ’em, join ’em! We are entering a new Dark Age where scientific principle is taking a distinct back seat to “belief”. EBM is giving way to BBM. It is all part of a plan by the Vogons to legislate the human race into extinction. Doubtless some of the potions that are available will have some active ingredient (herby stuffs being the cornerstone of almost all our modern therapies) but really thought the jury was in on this a long time ago. The quantities, concentrations and quality are not standardised, just like all other preparations pushed “under the counter”. Until those preparation that are pushed “around the counter” are validated as soundly as (we believe) those that are pushed “over the counter” there is no way on this earth that any serious medically trained medical practitioner should or could be expected to advise on how to take them. There is no obligation on the doctor whatsoever to support ideas that are outside the remit of conventional medicine. I suspect this is a ploy to get advice on Voodoo medicine and have Medicare pay for it, just like some of the present touchy feely rubbish. The only obligation we have is to be aware of the possible side effects and even then we can only trust the patient so far, to remember to tell us what they are taking. I know this is supposed to be a serious medical forum but here is a funny fact.. Professor Phelps won the 2008 Bent Spoon Award (presented to the perpetrator of the most preposterous piece of paranormal or pseudoscientific piffle) from the ASA (Australian Skeptics Association, not the Australian Society of Anaesthetists!) for her contribution to “quackery and woowoo”..
Are medical supporters of CAM guilty of intuitive rather than inductive thinking? Does intuitive thinking have any place in the dispensation of medical advice? A major review of 14 trials of the drug varenicline, sold as Champix in Australia, found people taking the smoking cessation aid faced a 72% higher risk of serious cardiovascular problems compared to those who try other methods, not to mention anxiety, suicidal ideation, etc. I am assuming we are talking about truly researched evidence-based medicine. When the COX–2 inhibitor rofecoxib (Vioxx) was withdrawn from the market in 2004, the focus of doctors and the media was — understandably — on the cardiovascular risk for patients who took the drug. This too was truly researched evidence-based medicine. Demand for action on research fraud (MJA InSight 16 June 2011) highlighted an article of German anaesthetist, Joachim Boldt who was caught out defrauding the evidence. And I could go on. As Prof Phelps rightly states: “A lot of the pharmaceutical treatments that were supposedly evidence based have been discredited, negative studies are not published and so on. I think evidence itself is flawed.” It is not my intention to name the many drugs we give to patients that have been potentially dangerous enough for them to be taken off the market. Admittedly, one would hope that this is not the norm. Nor is it a norm of the innuendo of increasing danger of CAM medicine. CAM practitioners don’t waste time challenging doctors that consumers were increasingly exposed to “a plethora of nonsense (science) claims that endanger their health, from ineffective care strategies that not infrequently, cause harm”. Prof Dwyer is a known skeptic of CAM for many years, and as we can see above, some doctors agree with him. Thank heaven there are health practitioners that ignore criticism and ignorant and offensive comments, doctors who are truly looking for answers to help their patients, by integrating whatever works best. Nothing new or better was ever developed by only holding on to the old. Is that Kerryn Phelps quote for real? Did she really mis-speak the truth and admit “I think evidence itself is flawed.” Meaning presumably that she rejects the very premise of science. Right so, in this version of the profession, what are we left with, our gut feelings? And we protect folk from the purveyors of snake oil by… how again? We are not hippies in a 1970s humanities department, in love with Derrida and arguing that all truth is relative, etc. If as a profession we were to cease to believe in the value of evidence and peer-review then we are of no value whatever to the Australian community and should be collectively burned at the stake. How depressing to recall that ‘professor’ means ‘teacher’ and that this view of medical practice in 2011 is purveyed to a new generation of… um… why to I hesitate to type the word doctor? Please God the current generation’s bullshitometers are working. And Andrew Kinsella, no point grizzling that lack of peer-reviwed evidence is regarded as lack of peer-reviewed evidence. The profession is duty bound to identify when evidence is weak, for all therapies. There is no special diluted category for ‘complementary’ evidence where warm feelings about efficacy are counted as being of value. Being a plant by the way is fine if it works… as a for instance the foxglove has in recent centuries been embraced warmly by the profession. When the strongest argument that can be put goes along the lines of ‘the customers will vote with their feet’ we are again in the wrong faculty, ie, we are talking commerce not science. Perhaps Prof Dwyer and all those who worship at the temple of “evidence” might like to explain how suppression of negative studies, ghostwriting, twisting of statistics, industry sponsorship of 65% of clinical trials, selling sickness and use of “key opinion leaders” fits in. A walk in the park is not “treatment” but you feel better for it. It is not ethical to prescribe alternative therapies for the simple reason that if they work they are no longer alternative they become the mainstream. If you want to prescribe them then it must be part of a research project approved by the relevant ethics committee. To do otherwise is unacceptable medical practice. I don’t believe anyone would say EBM is completely perfect, but rather is our current best framework. Yes there are numerous problems, but none that make the system fundamentally unsound. Would you argue against democracy in favour of tyranny on the basis that the democratic system is prone to all sorts of problems, like politicians not keeping up with their promises? As the leading professional association for Australia’s natural medicine practitioners, the Australian Traditional Medicine Society (ATMS) is very concerned to see sections of the health community once again opposing a popular and successful method of health care due to a lack of understanding. 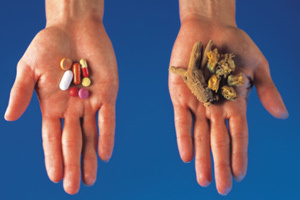 The use of natural medicine spans hundreds of years, with results well documented. Natural medicine practitioners are dedicated to their clients and to achieving a positive result. A holistic natural medicine treatment is very effective, and in many instances is all that is required to resolve a patient’s concerns. However, it is acknowledged that there are times when a patient may desire or need additional therapies. At these times natural medicine may be used in conjunction with mainstream medicine to provide very successful outcomes. While there are undoubtedly purveyors of products and treatments whose sole aim is to generate profits, this does not represent true practitioners of natural medicine. ATMS members are highly trained in their chosen modality, with ongoing professional development a critical element of their practice. A stringent code of practice ensures all members are aware of their responsibilities, as well as providing consumers with an avenue for recourse in the very limited number of instances where a complaint is lodged. It is time that the medical profession accepted the possibilities presented by natural medicine, as well as the way its use is accepted and encouraged by many Australians. @Bruni Brewin: The reason we know about the problems of Champix and COX-2 inhibitors is thanks to EBM. Your examples support why we need to embrace EBM and reject the anti-evidence stance that many proponents of CAM quackery maintain (such as Dr Phelps). @ATMS: I assert that you are either lying or simply incredibly ignorant when you claim that “holistic natural medicine treatment is very effective”. We both know that there is little to no strong evidence supporting the use of any traditional medicine for any condition. St. Johns Wort probably has the highest level of evidence out of anything ‘traditional’, and even that has significant problems (eg. country of origin bias) such that it cannot be routinely recommended as therapy. To the ATSM – why is it that orthodox medicine is held to different standards by the community? Commentators have rightly pointed out that some orthodox treatments have been found out to be harmful, and later removed from practice (even though the benefits might have outweighed the complications). Surely this is a key feature of the scientific approach – as new knowledge is assimilated, practice is adapted to accommodate the new knowledge. Quite different from ideology or belief, that remains immutable despite evidence. I don’t know what you mean by the comment above “A holistic natural medicine treatment is very effective, and in many instances is all that is required to resolve a patient’s concerns.” Where is the evidence of “very effective”? Why not simply apply the same principles to all therapeutic products – they are either shown to be effective and have a cost-benefit, or not? It’s not about “traditional” vs “modern” – it either works and is worth the money, or it doesn’t, no? @Dr Joe – nothing like a bit of healthy paranoia to liven up the “debate”. And by the way, there’s not a jot that’s alternative about a “walk in the park”. No need to conflate a healthy lifestyle with ear candling or cupping therapy! Not sure where this belief that medicine is science based comes from? “According to the editor of the British Medical Journal, Richard Smith, only about 15% of medical interventions are supported by solid scientific evidence. According to Professor David Eddy, of Duke University, only 1% of the articles in medical journals are scientifically sound and many treatments have never been assessed at all. Elliott Valenstein (Stay Free! interview, Fall 2003). Elliott Valenstein, in Great and Desperate Cures (1986). Even the supporters of alternative medicine would have to agree that there is a huge amount of woo being peddled which clearly doesn’t work. Why are altmed supporters so infuriated by demands that they show some kind of evidence … surely this should be demanded of all treatments – mainstream or not. A question for Mia – if you really believe that evidence in orthodox medicine leaves a lot to be desired, are you railing even more against the lack of evidence for so-called “alternative” treatments? It doesn’t make sense to exempt the “alternative” system from the criticism and scrutiny that you are leveling at orthodox medicine. Then there is another aspect of “evidence-based” that is often neglected – it relates to whether the proposed treatment is feasible in light of known pathophysiology. So, for example, we know what the physiological effects of the NSAIDs are on different parts of the body – the inflammatory pathways, the gastric lining, kidneys, etc. This is all evidence. On the other hand, the homeopathic theory that infinite dilution of a pathogen to the extent that there is no detectable amount left in water would cure anything does not stand up to any experimental or physiological evidence – nobody has laboratory evidence to support such a mechanism. There is a desperate (and often arrogant) attempt to prove that ‘western’ medicine is nothing but objective and science based. We fail to factor in human nature – and bad science – into the equation and so refuse to see the distorted ‘image’ . The same rigor should be applied to every branch of medicine/therapy. If lack of evidence is unacceptable, it should be unacceptable within ‘western’ medicine as well. Mia, your numbers require validation but any deaths from malpractice requires peer review and correction of the cause. Records are reviewed, informed consent should be obtained and changes in practices occur to help prevent future complications. You do not mention the millions of lives saved, improved and years extended by modern medicine. Alternatives usually do not provide informed consent(cannot offer percentages improved or harmed without data), save no lives, offer benefits by placebo effects and have minimal if any monitoring to even determine any numbers harmed. Many deaths in medicine occur in critical patients with multiple comorbidities who are not treated by your fake treatments, but are at greater risk for any treatment.